Experience fine quality combined with superior design in a VIGO frameless shower door. Single water deflector redirects water toward the inside of the shower. Side and door clear seals keep the shower watertight between wall and glass door or fixed panel. Full-length clear seals make the shower waterproof where door and side panel overlap. Enjoy the elegance, style and efficient operation associated with the quality of Paragon Bath PRIMA collection shower enclosure. The PRIMA Collection features a premium sleek 3/8 (10mm) thick tempered glass along with a convenient shelf to place items. 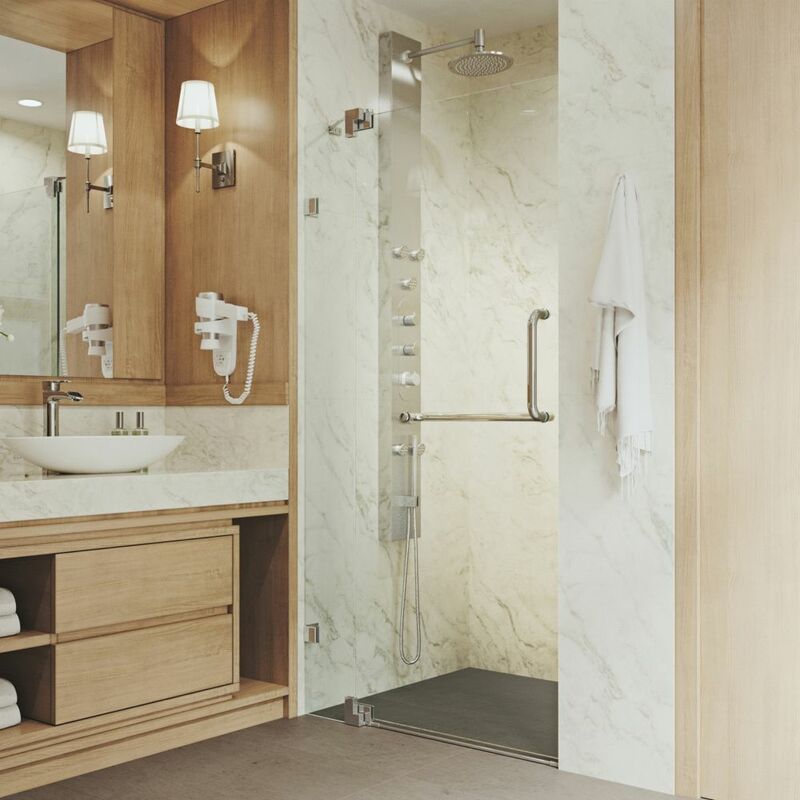 With the precision engineered high quality stainless steel and brass hardware and the beautiful chrome mirror polish, you will enjoy your luxury shower door beauty for many years. The handle towel bar combo design allows for a convenient place for your items and the hinges provide smooth door opening and closing. PRIMA comes with our innovative water capturing hardware at the bottom of the shower door to direct water into the shower and to keep your floor dry. Side and door clear seals keep the shower watertight between wall and glass door and prevent leakage. The PRIMA design allows your shower area to maintain its look and style through with the frameless layout and creates a beautiful, minimalist design that is hard to match. Clear and Chrome Frameless Shower Door 36 Inch 3/8 Inch glass Experience fine quality combined with superior design in a VIGO frameless shower door. Single water deflector redirects water toward the inside of the shower. Side and door clear seals keep the shower watertight between wall and glass door or fixed panel. Full-length clear seals make the shower waterproof where door and side panel overlap. Clear and Chrome Frameless Shower Door 36 Inch 3/8 Inch glass is rated 4.6 out of 5 by 89. Rated 5 out of 5 by Anonymous from The Vigo Pirouette is the second Vigo shower door system... The Vigo Pirouette is the second Vigo shower door system I have installed. It is a great product and the instructions are helpful. This shower replaces a fiber glass one piece unit and is a wonderful upgrade.